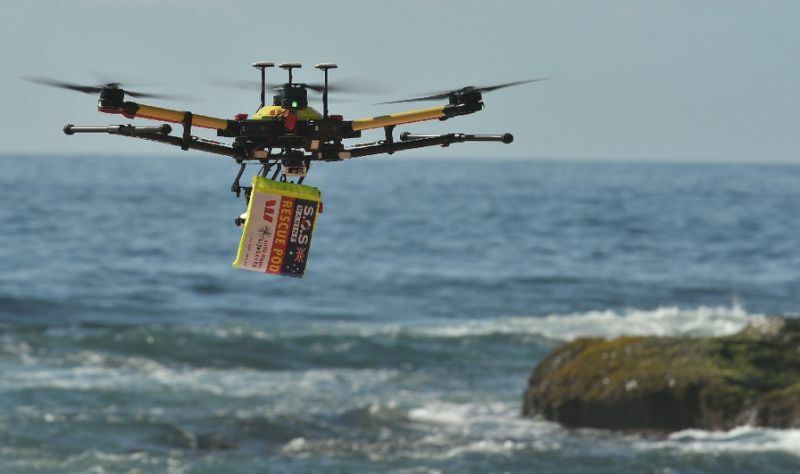 Lifeguards in Australia were able to use a drone to drop a flotation device to two teen-aged swimmers who were caught in rough surf. It happened Thursday, January 18, 2018 at Lennox Head, a beach on the north shore of Australia frequented by surfers. Lifeguards were conducting a training session with the drone when they were alerted to the situation. Two boys were struggling in 10 foot swells about 2,300 feet offshore. The drone pilot was able to fly to their location and drop flotation device designed to inflate automatically when it contact water. The two boys were able to hang onto the device and paddle safely to shore. “I was able to launch it, fly it to the location, and drop the pod all in about one to two minutes,” said lifeguard Jai Sheridan. The rescue took only 70 seconds, compared to the six minutes it would ordinarily take for a lifeguard to reach the swimmers. It was all captured on video by the camera on the drone. The bright yellow and red drone is known as Little Ripper. Australian lifeguards have been experimenting with using drones to spot sharks and jellyfish in the water near beaches. But this is the first time a drone has been used to assist swimmers by dropping a flotation device. The company that produces the Little Ripper drones is working on fitting them with other devices such as automatic external defibrillators and personal survival kits that can be delivered to people stranded in remote areas.